Fight Aging and the Signs of Aging. Thirty Five is the Best Age, So Feel Thirty Five For Life. From Brown Spots to Extra Fat to Rough Texture There Are Treatments To Keep You Young Looking. Thirty-five is the perfect age. Mature enough to be taken seriously, you enough to look your best. Expertise in CoolSculpting (not SmartLipo), IPL (Intense-Pulsed-Light), Botox, Juvederm, Voluma, Obagi, in Boise, Meridian, Idaho, Spa-Thirty-Five. Feel Thirty-Five For Life! Spa 35 is Boise's Best Medical Spa, dedicated to People Who Don't Want To Ever Feel Older Than Thirty-Five. Why 35? Studies have shown that people think Thirty-Five is about the perfect age. We're mature enough to understand what life is about and how to handle it, yet young enough that our physical features and abilities are vibrant. Research is finding that well planned fitness routines and a healthy diet can extend our lifespan. But in spite of our best efforts our skin and bodies start to show the signs of aging. That's where Spa 35 can help. Our minimally invasive procedures help maximize your physical attributes, and minimize the signs of aging while you're working on your fitness and eating habits. Results vary. Before and after picture of CoolSculpting non-invasive fat removal of an adomen area. *Results vary by individual, photos are used as examples only, your results may not match the photographs. Genetics, diet and exercise all influence your results. If you consume more calories that your body burns the resulting fat will be stored in your remaining fat cells, which will have a different distribution than before your CoolSculpting. There are a large number of options to help with these types of concerns and they range across all sizes of pocketbooks. 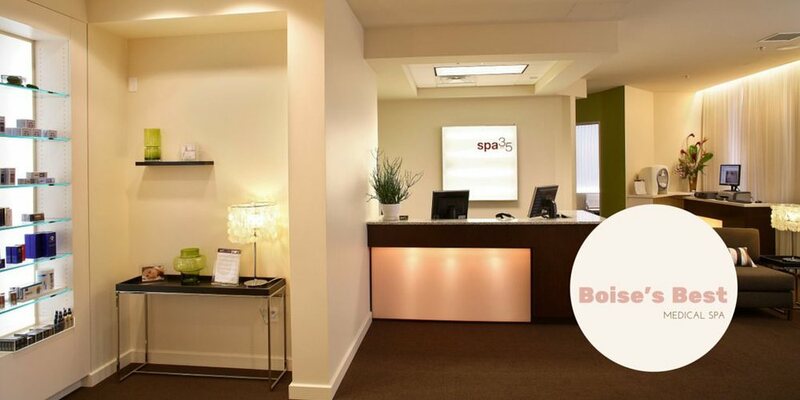 Spa 35 is all about helping people look and feel their best in a warm inviting atmosphere. The Spa 35 concept was originated from the convergence of a number of trends. We’re living a full, active life for longer periods of time, we're working for longer time periods and the young and mature are competing for the same opportunities, more of us are single and looking for a significant other, and technical advances are creating devices and products that were at one time unthinkable. The foundations of Spa 35 are advances in non-invasive light based (lasers) procedures and topical skin care products that reduce the signs of aging. The “35” in Spa 35 is because many believe 35 years old is the sweet spot of life. It is old enough that you're a respected adult, but you're not “old”. Now there are things you can do to slow and turn back the clock to look closer to 35 for longer than ever. The Spa part of the name was because most places delivering cosmetic services felt clinical and very effective procedures can be delivered in a place that doesn't feel like you're in the hospital. You should be able to have the same warm experience when you get a facial as when you get an injection. Many of us will eventually chose surgical options that require a hospital feel, but for the larger group that wants to slow down the appearance of ageing without a gown and a plastic chair, Spa 35 offers a broad range of services and products that improve your appearance and youthfulness in an inviting and relaxed environment. Spa 35 is located in the 11th and Myrtle Cosmetic and Wellness Center, where you can schedule a long list of great services to maintain your health and beauty. Our lives are the sum of our daily habits. At Spa 35 we hope to help you create a plan for the little changes that create big results. From a little sun screen in the morning, and a few minutes of exercise each night, to an occasional laser treatment, it’s the sum of the little changes that support your overall plan. Please schedule some time to come see the friendly staff at Spa 35. We enjoy speaking will people and helping you uncover your goals and find products and services than can help you.